CO2 Emissions Lowest in Seven Decades In Trump’s America | Watts Up With That? July 12, 2018 in Carbon dioxide. Not sure what Donald Trump has to do with this, afterall the graph has been more or less falling since 1950. Trump is the cause of everything. A rough rule of thumb is that everything observed that happens in the Energy Industry is the result of actions and plans that were instigated 5 years previously. There’s a long lag time in this business, and that’s as good a guess as any. Now this doesn’t give credit to any US President, but it DOES give credit to the US fraccing revolution, which dramatically increased Nat Gas supply here in the US, with one result being that far more industrial applications were comfortable switching their energy use to nat gas (including many power plants) Coal lost out because it was no longer cost effective. A whole lot of us have been saying for years that if you seriously and quickly want to reduce CO2 emissions, then replace coal plants with nat gas, which is combusted much more cleanly. But oh no, the enviros hated that idea, because the Evil Oil Co’s would still make money that way, so we can’t have that. Amazingly, it happened anyways, and it’s having exactly the effects that the nat gas proponents have always said that it would. Fracking turned everything on its ear quite fast. According to most of the liberals that I know, everything good that happened while Obama was in office was solely because of him. Of course everything bad was because of Bush or Reagan, in that order. “Trump is the cause of everything”. A liberal acquaintance of mine was claiming that Clinton caused the recovery from the Bush recession. The markets knew that Clinton was going to be elected and their exuberance was reflected in an increase in economic activity. Nowhere near true according to one guy I knew. The last two or three presidents are low grade also rans in the lecher stakes. St. John the Kennedy was known to have an eye for the ladies as well. Yes, president Harding did his thing in the Oval Office wardrobe. Things were were handled more discretely in those days. He is Super Awesome! Just ask Cartman. Yes Ballbounces, in the simple world of Fascists, Liberals and Progressives (FLAPS), all political problems are Trump’s fault and all Climate problems are the fault of CO2. What a simple-minded world they live in. Note: I include Fascists as they are the champions of political correctness. Better to call it: Trump-a-lot. You trolls have been predicting environmental disaster now that Trump is in office. in every year starting with DDT in the 1960’s. as predictions that come true! is hysterical about climate change! The gullible half, I assume. Exactly, this is just silly. Besides cheap natural gas due to fracking – which started while Obama was in office and has continued under Trump – the other big reason for increased NG use is pressure by groups pushing for reduced CO2 emissions. That has exactly zero to do with Trump – in fact, if Trump had his way, the US would be burning lots more coal and seeing increased CO2 emissions. …which increase in CO2 I fully support. Foodstuff production worldwide is the key to feeding the planet. With any luck, and the correct restacking of the SCOTUS, Perhaps the USA will be able to produce as much CO2 Volume per-annum as China does. Only because it happened on private land where he couldn’t stop it. Hate to break it to you, but production of natural gas by fracking began before Obama ever took office. What’s more, Obama DECREASED production on federal lands. The only reason overall production increased was from actions on private lands he couldn’t control. Well, I’d say that they are at the lowest level per person in 67 years, and coincidentally Trump is the president of the USA. Small issue I know, but Trump has very little to do with the current level of CO2 per person. There is an element of truth in that. The previous administration oversaw the removal of US industry to places like China, while presiding over a recession. At the same time that administration was unable to stop the reaping of natural gas despite its best efforts, which meant energy production expanded with lower carbon dioxide outputs, relative to the past. To know what will happen in the future needs an economic model that is verifiable and repeatable. Since the CO2 decline has occurred over many decades it is probably caused by the economy and manufacturers becoming largely more efficient. The US has avoided shutting down whole industries, as is happening in Australia, due to high power prices. In politics, it is VERY rare that the politician who initiates any policy is the same as the politician who is in power when the policy starts to deliver. Invariably this fact supports the two-party system, which is common in Anglo-Saxon politics. One party cuts outgoings and saves, producing austerity and a big budget surplus, then the other party takes over and proceeds to spend it…. In the USA, contrary to Obama, a lot of things happen that have nothing to do with whose is President or controls Congress. In most cases government has dang little to do with the successes or failures. Government can certainly delay success and make failures more dramatic like for say the home mortgage crisis in 2007-2008. In the US there is never “austerity”. Exactly. It was Reagan and Bush Sr. that initiated the base-closing process. As it was implemented during the Clinton admin., reducing defense expenditures by hundreds of billion of $, Clinton bragged incessantly that he was the only President to “balance the budget”– for 1 year. But Clinton had nothing to do with it. Clinton bragged incessantly that he was the only President to “balance the budget”– for 1 year. But Clinton had nothing to do with it. Give Newt Gingrich credit for those fleeting years of budget surplus. Clinton fought those changes with every tool he could pull out of his pants. Even then, the budget never really was in balance. They just used the SS surplus to hide the fact that the rest of government was still spending more than it took in. But you notice NO ONE in the establishment media ever credits Newt, or corrects Clinton (or any other democrat national socialist or ABCNNBCBS news propagandist) when they repeat this Fake News claim? Much less mention Social Security. my subscribers have trouble sleeping. Yes, even though there was a budget surplus, the nation’s debt kept rising during those years, although a bit slower than before. Even so, it’s Gingrinch, the Contract with America, and the Republicans in Congress who deserve the lion’s share of credit for the improvement in those years, and it was a notable improvement. The loss of heavy industry in the US started LONG before Obama showed up. Trump has very little to do with the current level of CO2 per person. What? But they said Trump is to blame? Was it fake news? I’m shocked! Who is “they” and exactly what was their claim? Trump hasn’t been in power long enough for anything he’s done to have a noticeable effect on CO2 levels yet. That could well change over time. It’s kinda like him claiming credit for low unemployment levels, and never mentioning that most of the drop in unemployment since the GFC happened under Obama. So, what you are telling us is Obama succeeded in destroying America’s energy production, manufacturing and agricultural industries and you happy about that. Got it. Any proof for those claims, 2hotel? Ya know, when you are at the bottom of a hole and dirt is raining down on your head, an intelligent person would stop digging. Guess that point is settled. Grab another shovel for your other hand! Another zero content reply from 2hotel. Pathetic. Don’t worry, oh, who am I kidding, all you do is worry about nonexistent crap and ignore reality. Carry on, I got another 34 acres of wheat to cut. So what? American companies are increasingly demanded lower CO2 emissions from their energy providers. Go ahead and invest your money in coal mines and coal fired power plants and see who lines up to buy your electricity. No they aren’t. American companies are seeing a financial benefit to utilizing solar and wind, and that’s all. “‘We didn’t intend to do this as a statement about Paris, though it has become a statement that we’re definitely still in,’ said Brian Janous, general manager of energy at Microsoft, which has so far bought enough wind and solar power to match 50 percent of the demand from its global data centers. As long as it makes financial sense for the business to use these alternative energy resources, they will. If/when it no longer makes sense, they won’t. Electricity from solar and wind is both expensive and unpredictable–it’s the opposite of “base load”, sir. But, propaganda has a way of making people say unusual things. So you would argue that Microsoft is lying to fulfill a propagandist motive, when the “propaganda” is to deny the Green motive in favor of the profit motive, which would therefore put them in the good graces of the American Left? Actually, they have committed to go out of business. All they are doing is pretending to do green so that the myrmidons like you will flock to them. Hahaha. Yeah, Apple is going out of business. And Visa. And Ikea. And BMW. And Citibank. And GM. And Google, etc. What do you make such patently false statements? Why do you keep making nonsensical claims about companies actually intending to go 100% renewable. When their actual actions belay their words. Regardless, as usual you have to lie about what I actually said in order to criticize me. I said that when they do go 100% renewable they will be on the way to bankruptcy, I said nothing about what they are doing now. Especially considering all they are doing now is talking about going renewable. All the better to snooker the gullible. Such as yourself. PS: Let me know when press releases become legally binding documents. One constant with trolls, when in a hole, they dig even more furiously. Is Apple lying? Yes. The issue has been covered on WUWT multiple times as to what Apple is doing. If Apple does actually start using 100% renewable, they will be on the way to pricing themselves out of the market. They may have made the headquarters building 100% renewable (unlikely, but that’s what they want us to believe), however known of their factories are and none of their sales stores are. Yes, Apple and you are lying. They never will, because they aren’t going to shut down the company every time there is a windless night. “False. The companies are not saying “hey, we’re going to buy the cheapest power” And yet that is exactly what they do, that and tell lies about how they only buy “renewable” electricity. Tin foil hats 2hotel and MarkW ridesagain. No evidence provided, just their usual unsupported rants. Watched another line of trucks hauling coal out of a new mine here in Western PA! Maga! Now back out to cut more wheat and burn more diesel. Life is Grand! Gee, all of 138 large companies out of the more than 18,500 large businesses in the USA? How impressive! /sarc. Those companies are simply sucking off the American taxpayer, taking advantage of the massive subsidies for wind and solar. It’s an absurd disgrace foisted on us by the Obama administration. What’s more, it’s a very good bet that the majority of those companies never go anything close to 100% renewable energy anyhow. And even if they do, they’re just harming the taxpayer and not helping the environment – it’s a huge political game, nothing more, nothing less. Source: U.S. Census Bureau, SUSB, CPS; International Trade Administration; Bureau of Labor Statistics, BED; Advocacy-funded research, Small Business GDP: Update 2002- 2010, http://www.sba.gov/advocacy/7540/42371. In 2010 there were 27.9 million small businesses, and 18,500 firms with 500 employees or more. Everybody is lining up to buy that electricity, Chris. Practically nobody cares what the source is as long as it is cheap! And renewables are the antithesis of cheap! The only thing companies are demanding is that energy costs be kept low. The same as everything else they buy. False, the list I provided is companies that have committed to go 100% renewable. Not companies who have committed to buy the cheapest electricity, regardless of the source. They have put out a press release about actions they are going to take decades from now. And as usual, you are impressed. As always, look at what they are doing, not what they are saying. You are so eager to believe that the world worships as you do, that you are willing to grasp at any reed, no matter how weak. Apple is running on 100% renewable NOW. Microsoft is over 50% RE NOW. IKEA will be 100% renewable by 2020. Are there some that are farther out? Sure, like GM by 2050. So you take the one company that is decades out and apply that to all, which is false. Not even close to being true. But then again, truth was never your goal. So Apple shuts down shop every time there is no wind at night? Is Eloon Gantry on that list of hucksters and liars? Tesla can only exist if coal and nuclear and hydro and gas supply cheap electricity for Eloon Gantry to exploit. Coal is back, and it is here to stay. People are happily paying less for electricity generated by coal plants. Old plants are being refitted with new systems and new plants are in the permitting process as we speak. Nothing you can do to stop it. As for proof, do you know how to use google? Can you actually read the printed word? Or are you simply going to continue to deny the actual history of the last 8-12 years? Go ahead, for the foreseeable future it is a free country and you can do whatever you wish. America will keep using coal, oil, gas, nuclear and hydro to produce energy. It is just gravy on top that us doing that makes you sad. Very true (and in the spirit of full disclosure, I’ve actually designed a few coal mines in Montana and Wyoming). The past administration drove the cost per ton of coal to around $30 a ton; it has more than doubled. Demand is up and all those CO2-starved plants are grateful. You make claims you don’t back up? Ok, got it. If you are too lazy to defend your points, I’m not going to do it for you. Especially since you are wrong. “I will tell you, it’s not a matter of if we’re going to retire our coal fleet in this nation, it’s just a matter of when,” Fowke said. But hey, what does the CEO of a utility that has 7 coal fired plants know? 2hotel is the expert, even though he hasn’t provided any evidence to support his claim. Coal is back, and the best part is it makes you cry. Loving it! Oddly enough at the same time US coal exports to Europe are booming. I wonder what they do with the stuff. Do they eat it? And yet coal is back, older plants being reworked and reopened and new plants being built. Grab a box of tissues, made with coal fired electricity, cause you need to wipe your teary eyes, honey. Ahh, the tears are flowing now! I love it. And got nothing to defend, sweety, facts are facts, ignore them at your peril. Your self delusion is amusing to watch. It’s like watching a bad Petri dish experiment. You’ve provided zero supporting evidence, as usual. Coal exports are unrelated to domestic consumption. And you equate the two as if that means something. I’ve gotten the “Coal is Dead” meme from some of my brainwashed kids (rue the day I pay for any more of the bogus college education they’re getting) while your politically-tainted rants and raves about it bely your hatred for a CO2-rich atmosphere that substantially contributes to foodstuff production worldwide. Information you rely on is so Fake News it’s useless in your defense, Chris. Do your own research, Chris. I’m not your tutor. Besides, you’re so brainwashed with Fake News I could claim the sky was blue and you’d obviate with pictures of clouds. No, Rocky, you’re lazy. Too lazy to defend your own points. The idea of a debate on issues is that each party defends their position, providing evidence to support it. Not telling the second party to look up evidence that support’s the first’s. Laughable. And the level of CO2 has very little to do with the global climate. It tends to be a trailing indicator, not a leading one. yeah but he is causing a lot of hyperventilation by the wacky left, so he may be increasing CO2 per person in some cases! But Paris Accord! Kyoto Agreement! We can’t be doing so well since we chose not to be in these agreements! Unpossible! You’re still in the Paris Accord. No matter. Our money has been pulled…that’s “effective” enough withdrawal for this taxpayer. Yep – and next to that the entire Paris accord was nothing but smokeblowing and wishcasting, with no enforceable directions on anything. That’s why the Paris accord is collapsing around the world now that Uncle Sugar has cut up the credit card – the spendthrifts are all starting to realize that there was nothing else of any actual import in that agreement, other than a promise to have drinks and hors d’ouvres on some Caribbean island at least once each year. Lol, -4 votes for stating a fact! edit: No, wait, -5.. And sure to go up from here. edit: No! Wait! We’ve got a comeback! -4 and holding…. Is it wrong how amazingly amused by this I am? I may also be a bit drunk at this point, but please don’t hold it against me. I’ve had a few too many beers, and I don’t have to work tomorrow, because Grafton horse race local pissup public holiday or something. Grafton: Far North Coast of New South Wales, Australia, if anyone cares. Damnit… Back to -4. Meh, at some point in time this system is going to stop me from editing this comment anymore. It’s a fact, it’s also not relevant. -8 …. Sadder face… All good. Beer will fix it! Try a gallon of vodka. Actually, -4 votes for sniping an irrelevant fact. We were never “IN” the Paris Accords. Sigh. Obama bought it in to force through an executive order. The US was never in the accord, because it was never ratified by the Senate. Pardon, Paris was NEVER a TREATY for the USA. Therefore there is nothing legal binding the country. The President can have the country walk away at any time; same with the Iran nuclear fiasco. Obama’s thought he was so smart by not presenting the Paris Agreement to Congress for approval. He didn’t want to have Congressional debates over the details since it would give way too much information to the American people. He believed the Paris Agreement would continue under the next Democratic President which he believed was guaranteed. Fortunately it was not ratified. Had it been you could expect lawsuits from all over based on every extreme weather event. Obama was in it. The USA was never in it as it was never put before Congress for ratification. Obama was in, so long as someone else was paying. Industry’s contribution to a greener earth! The comparisons are pretty invalid. The EU/Europe has a number of countries sill playing cacth-up after decades of Communism. They are getting richer from a pretty low base relative to the US or say Germany, and thus CO2 emissions per capita are rising. You need to compare the US with Germany, France and Italy, not the EU as a whole. Playing ‘catch-up’ after decades of Communism means replacing old, worn-out and polluting equipment with modern efficient and clean systems. This will produce a considerable apparent improvement, not a diminution. We are talking rates here…. 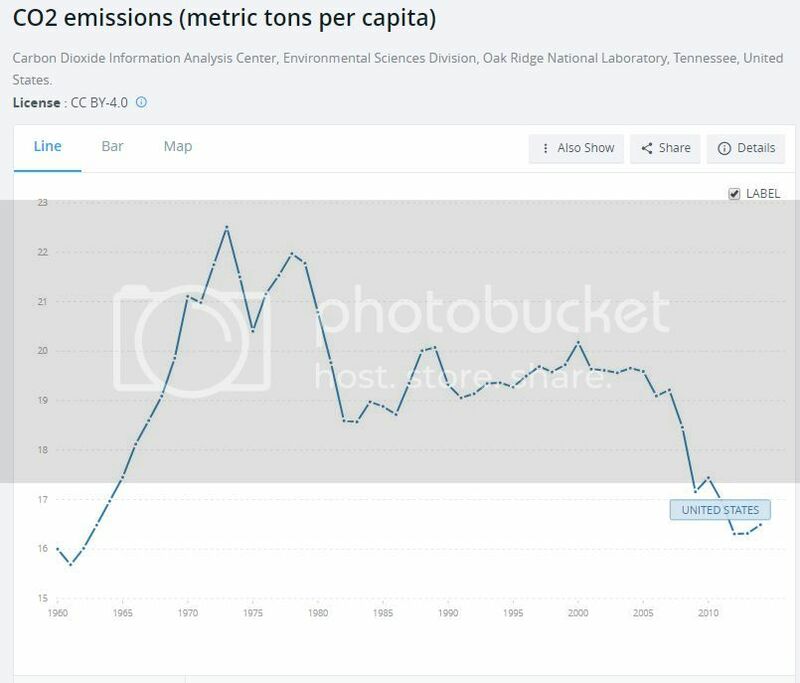 couldn’t be any more bogus If you tried…total US carbon emissions doubled since 1951..
a wonderful demonstration of stats..
What part of that do you not understand ?? the color would now be deeper…just due to the “non increase” in the US..
Would prefer that we still be emitting at the same per capita figures as in decades past? What’s bogus about a per-capita comparison? Nothing, but the problem is the absolute numbers – the population now is somewhat different to what it was in 1950. Not that I have any quarrel with that but it is a selective choice of numbers to emphasise. Per capita shows that we are getting more energy efficient. I thought that was supposed to be a good thing? I guess we should just go back to using incandescent light bulbs since efficiency doesn’t matter any more. total co22 emitted per year , it has no value.. Thanks for demonstrating what low-IQ readers do — they don’t read past the first couple words. you would be dancing with joy if theUS pop went up another 100 percent ,as the per capita co2 went down..?? Since total CO2 is a number that doesn’t matter, I wouldn’t care. Yes. Yes I would. It would mean more food for the earth’s plants & a further shot-in-the-arm for life in general. Didn’t you study simple biology in school? And total Chinese emissions have done what? Quadrupled or greater? The first link “latest energy report from The Energy Information Administration (EIA)” goes to a BP report. Same on the Zerohedge article. Unfortunately the data ends in 2014. It’s time we started manufacturing, again. All this chart is telling me; we gave away our jobs. Can you imagine what could have been! To the rest of the world? Your welcome! I hope you have enjoyed it. President Trump is telling you that the Americans are not giving away anything, any longer. Well, could you give a list of the countries that make more per person in income than the USA? How many of them are in Asia? What matters is their per-person income rose and that for those in the USA declined. Absolute values are irrelevant. We didn’t give it away, we drove it away. This is not a positive, kids. This shows America in decline, and Trump is reversing that, so lets us check back in a couple of years. Co2 is not pollution, it is plant food and more is better. As for carbon, living things on Earth are carbon based. Get over it. The fact is that if Trump weren’t in office, CO2 emissions would even be lower. His lapdog Pruitt was running around deregulating the economy and opening the way for coal burning before he was ousted for ethics breaches. Trebla, I seriously doubt your statement. Most CO2 comes from coal power plants. Trumps efforts have lowered the cost of natural gas. Sub-$3/mmbtu gas has gas power plants heavily utilized and coal plants at roughly 50% utilization. From memory, only about 22% of this summer’s power is coming from coal. If you think it would have been even lower than that under a non-Trump president, you’re wrong. It’s certainly plausible that CO2 emissions would be lower because the economy was worse. This would (of course) be a bad thing. Oh my God, he was deregulating the economy. Is there no perfidy to deep for the b-tard? 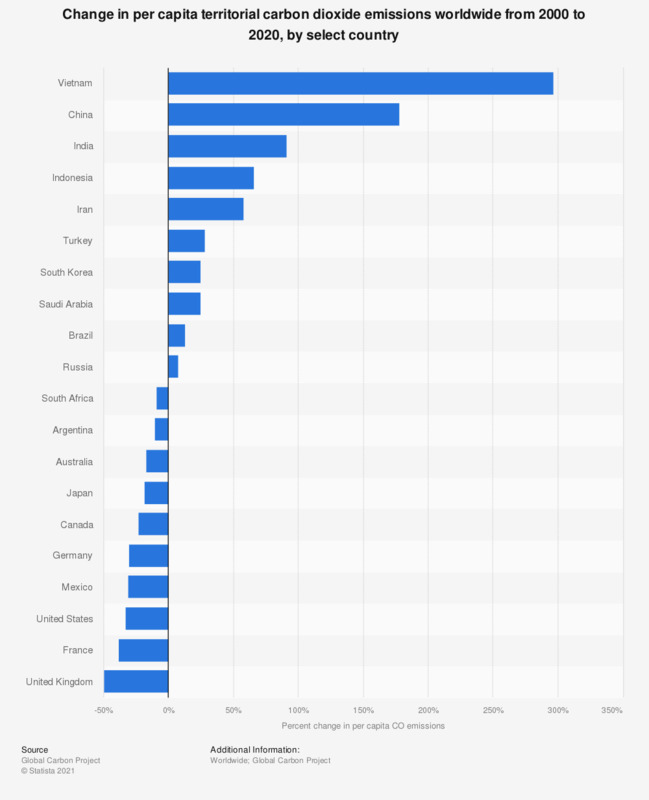 Australia could now start to increase its CO2 output per capita because the PM today gave a strong public signal – his first, IIRC – that Australia needs more fossil fuelled base load power. Subsidies for renewables are planned for large reductions. His advisers who for some years have been telling him about the strangulation by the Renewable Energy Target are finally getting heard. 12th July might just go on the national calendar as the day the electricity lunacy started to be reversed. Thank god we have so many illegals in the country to increase the “capita” portion of the equation. There seem to be factual inaccuracies in the zerohedge report. They talk of the latest energy report from EIA but link to the BP report. I don’t think there has been a recent IEA report of this kind. Theirs comes out in October. They speak of per capita, but graph per GDP. The BP report does not seem to have have recent per capita data. So it isn’t clear where the numbers cited came from. Of course, zerohedge might have used their own population estimates. In my humble opinion, most of that which comes out of zerohedge should be held to be suspicious and independently verified before believed. They tend toward conspiracy. It isn’t the Trump part that bothers me, it’s the “let’s hate Jews because they’re controlling the weather,” utter stupidity (in my view) of the regular audience. Gee. That’s exactly what the Iranian allies of Oboma said a few days ago: Israel was “stealing” their rain clouds! Interesting how like minds think alike but somehow hate each other, isn’t it? If you want lower per capita CO2 emissions, all that is needed is for the population to increase faster than the emissions. Long term, population increases strain all systems, so this is undesirable. The relevant statistic is absolute emissions. Measures such as per capita and per GDP don’t mean as much as the absolute numbers. This is just more statistical hand waving. It’s a matter of cherry picking the right metric to make your point seem more valid. One day, some filthy rich person with no agenda other than the real truth will lay out data in such a way that is most relevant. As opposed to per person …. what is CO2 output per manufacturing unit. I would say GDP, but in today’s world, too much of GDP is linked to irrelevant sectors, like banking, services, etc. And right there you let us know that you have nothing of value to say. BTW, why do you believe that banking, services, etc shouldn’t be in the GDP. They produce products that people value. First …. just how much energy does making a loan take? Not much. How much GDP is simply the result of value manipulation? A TON. If I dig up an once of gold, and it is worth $1000, …. then I dig up another once of gold, but this time it’s only worth $500 ,,,, I just doubled the CO2/GDP for that once of gold. Once again, Dr. Dean demonstrates first that he has no idea how the real world work and secondly that he has a pathological hatred for anyone who has been more successful than he. First off he starts off with a complete non-sequitor, we are talking about GDP, not energy usage. Regardless, he claims that making a loan has no impact on GDP. Completely untrue, the company receiving the loan then turns around and builds something, that something then contributes to GDP. If you dig up 2 ounces of gold you have doubled the world’s supply of gold????? You really need to work on your analogies, you are still making no sense. Ah yes, the standard whine of the unsuccessful, the rich don’t work. BTW, you have no concept what the truth is. All you have is a deep seated hatred of those who have been successful. Mark …. you really need to put your preconceived notions away, and actually read what I wrote …. and comprehend it. CO2 per capita is a poor metric for expressing any change in absolute CO2 emissions. This says nothing about my position regarding CO2 emissions. You said that I claim banking has no impact on GDP …. LOL … I said the exact opposite. (Those preconceived notions again) …. I said GDP is not a good metric BECAUSE non energy consuming activities such as banking, and I didnt limit it to banking … Soros currency manipulation scheme, the tech bubble of the 90s, the over appraisal of land value of the Housing Bubble, Obama’s porkulus bill, …. all these things contributed to GDP but exist in a virtual world that does not involve CO2 emissions. I don’t need you to misinform me of how the economy works. No Thanks. Since you didn’t get what was being said with the gold analogy, I’ll just say, go back and re read it. …. then think about it …. put it in its context …. pay very close attention to what is being illustrated. ….. I can tell you, it has nothing to do with doubling the amount of gold. As for the Rich People comment, again, you seem to think I hate rich people. (Those wrong preconceived notions yet again). Even after I explained it, you STILL didn’t get it! Wow … I mean just wow! Again, go back and re read it …. open up your closed mind and put you silly preconceived notions away. Think in these terms …. the Berkeley dude went and made the BEST temp metric (I don’t agree with BEST … but it served his bias)….. Soros created MoveOn.org …. again, I completely disagree with Soros, but MoveOn.org serves to disseminate his biased view on the public. ….. now …. just imagine if there was somebody on their level of wealth who was dedicated to publishing and disseminating the correct statistical presentation of such relationships. CO2 per capita is the wrong metric. It is a metric, but the wrong one. P.S. …. in my former academic career, I discovered everything WRONG with the Academic cabal …. hence why I left!!! (Your silly wrong ASSumptions and preconceived notions leading you astray ….. yet again). And …. btw Mark … as a former resident in the world of Academia …. I can assure you, my main point was spot on. This is all just a bunch of statistical mambo jumbo. As a former member of academia. Well that thar is your problem. No wonder you have no idea how the real world works. The basic premise of this discussion is the usual warmist bullsh!t. Amen to that. It’s unfortunate that articles like this are considered important to publish at all, given it affords their premise credulity. under President Trump, per-capita carbon dioxide emissions are now the lowest they’ve been in nearly seven decades. 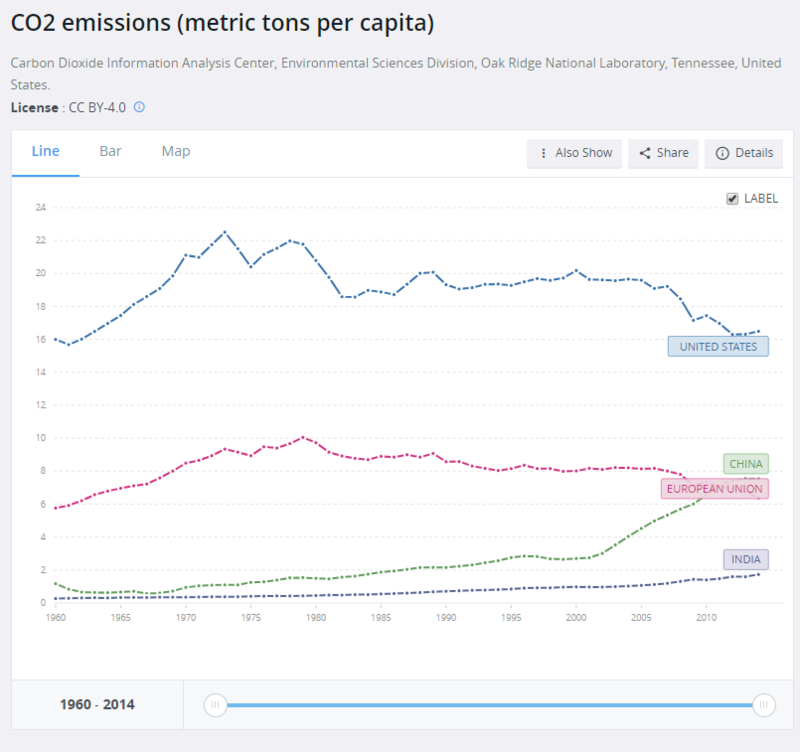 per-capita carbon dioxide emissions are now the lowest they’ve been in nearly seven decades. So, how was life before you were informed by Trump? Back when you didn’t know what the carbon dioxide emissions per capita were in the past, or what they are now. how was life before you were informed by Trump? Back when you didn’t know what the carbon dioxide emissions per capita were in the past, or what they are now. Not really… Should I assume that English isn’t your first language? I don’t mean that as an insult, just that it is kinda hard to understand what you mean. You can assume that ‘Schaeffer’ is migrated german “Schäfer, Schafhirte”. Insulted second hand language shepherds. Well, righto, but I still don’t understand what your previous post was trying to say. U.S. drop in CO2 emissions happened for the wrong reasons, and that’s what counts. So there! But is it a good thing? I would prefer coal, less damaged landscape and cheaper electricity. Thus, the US alone emitted 15.8 x 325.7 million = 5,146.06 million metric tons of CO2. Or, …… 5,146,060,000 metric tons of CO2, …… or 5.146 Gigatonnes of CO2 in 2017. And to wit, …… “the Carbon Dioxide Information Analysis Center advise that that 1 part per million of atmospheric CO2 is equivalent to 2.13 Gigatonnes of Carbon”. Therefore, the US’s emission of 5.146 Gigatonnes of CO2 potentially should have increased atmospheric CO2 by 2.42 ppm. And if one adds in what Europe, EU, China and the rest of the World emitted in 2017 then the atmospheric CO2 should have increased by a minimum of 7 to 10 ppm. That 2.13 gigatonnes is carbon not carbon dioxide. in China and other parts of the world. in a way that is NOT beneficial for our planet. I get the point of this news, but it reenforces the big lie that lower c02 is better, when the opposite is true. Title of graph immediately following: “Primary Energy Production per Real Dollar of GDP 1949-2017.” The graph is about the carbon intensity of the economy, not per capita emissions! Statement: Even more interesting is the fact that US carbon emissions dropped while emissions from energy consumption for the rest of the world increased by 1.6%, after little or no growth for the three years from 2014 to 2016. OECD (37% of world emissions in 2017): +0.7% (2017), -0.8% (2006-2016). US (15% of world emissions in 2017): -0.5% (2017), -1.2% (2006-2016). EU (11% of world emissions in 2017): +1.5% (2017), -2.0% (2006-2016). non-OECD (63% of world emissions in 2017): +2.1% (2017), +2.9% (2006-2016). China (28% of world emissions in 2017): +1.6% (2017), +3.2% (2006-2016). India (7% of world emissions in 2017): +4.4% (2017), +6.0% (2006-2016). The difference between the 2.5% increase in European emissions in 2017 and the 1.5% increase in EU emissions arose mostly from calling Turkey (12.7% increase in 2017) a European nation. Well, this is bad news–what are the plants supposed to eat?? Gotta love capitalist efficiency. As if I gave a @$#$#% about C02 emissions anyway, but it is a natural by-product of cutting loose progressive dead weight. 1. According to the experts Trump would lead to more and more environmental disasters, but apparently the experts are wrong again. 2. Under Trump manufacturing has increased and the EPA has killed a bunch of regulations, both of which will lead to disasters, but that is not happening. What gives? of course our emissions have fallen. We’ve been deindustrialized. Thank China, India, Malaysia . . . and so on.